Serving Windsor Park homeowners, renters and businesses as stewards of the neighborhood plan. These are the official comments of the Windsor Park Neighborhood Plan Contact Team on the first proposed CodeNEXT zoning map for the area covered by our neighborhood plan. The Windsor Park Neighborhood Association endorsed these comments by unanimous vote its the July 8th meeting. The property at 5936 Westminster Dr. (Windsor Village at Berkman Drive and Briarcliff Blvd.) should be zoned as T3.MS. This property is directly across the street or adjacent to proposed LMDR and T3N.DS properties that currently have detached, single-story, single-family homes. However, the property is large enough (538,488 sq. ft.) that substantial density and height could be achieved in certain parts of the property. Due to the nuanced nature of the property, the contact team is seeking to create a Planned Unit Development through negotiations with the property developer. In the event that a PUD cannot be achieved and due to the property’s position directly adjacent to current, single-story homes, the Windsor Park contact team believes that by-right development for the entire property should not exceed T3.MS. The properties at 1660, 1646, and 1636 East 51st (E. 51st St. and Berkman Dr.) are proposed as T5.MS. While this might make sense in the context of being across from the Mueller development, the proposed designations are only for the front half of the properties, which are already developed. This is also a very congested intersection in which traffic entering and exiting the small lot at 1660 E. 51st st. is already a problem. It is simply not practical to have a T5 zoning for this area. The Windsor Park contact team recommends a lower-density zoning for these properties. The properties at 1110 E 51st St, 5129 Cameron Rd., and 5209 Cameron Rd. (the intersection of 51st and Cameron Rd.) are proposed as T5U.SS-O. These are relatively small properties and the adjacent intersection has substantial congestion issues being an entrance/exit point to I-35. Such intense density there – including accommodating parking structures – is not practical for these properties. The Windsor Park contact team recommends a lower-density zoning for these properties. The properties at 1040 E. 53rd and from 5303 Cameron Rd. to 5517 Cameron Rd. (the east side of Cameron Rd. from just north of 52nd St. to just south of Cloverleaf Dr.) are proposed as Service Commercial (SC-O), General Commercial (GC-O), Service Commercial (SC-L), and Community Commercial (GR-V-CO). Cameron Rd. is designated as an Austin Core Transit Corridor. 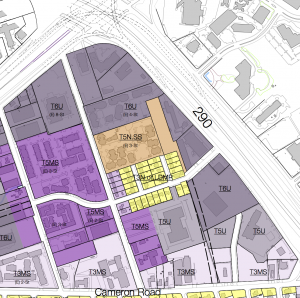 In the Windsor Park Neighborhood Plan, the mixed-use residential development is called for here, which is incompatible with the proposed zoning. The Windsor Park contact team recommends T4.MS for this stretch of Cameron Rd. The property at 1200 Broadmoor Dr. is currently proposed as Community Commercial (GR-MU-CO). The property is currently developed as a large apartment complex, but should be part of the Cameron Rd. mixed-use corridor. The Windsor Park contact team recommends a zoning of T5N.SS for these properties. The property at 5701 Cameron Rd. is proposed as Neighborhood Commercial (NC-O). This property is currently utilized as a church and is part of the Cameron Rd. corridor. The Windsor Park contact team believes that it would be more congruous with the rest of the corridor – particularly the eastern side – if it were zoned T3.N. The area south of 53rd between I-35 and Cameron Rd. is publicly owned property as part of the I-35 right-of-way. It is currently proposed to be zoned as Service Commercial (SC-L). It should not be zoned at all. The properties from 53rd north between I-35 and Cameron Rd., up to 5340 Cameron Rd. and 5339 N. I-35, are currently proposed as Service Commercial (SC-O and SC-L). These uses are incompatible with a neighborhood and the neighborhood plan. The Windsor Park contact team recommends T5.MS to shape this property into a neighborhood mixed-use center. The properties at 5407 N. I-35, 5621 N. I-35, 5600 Cameron Rd., 5630 Cameron Rd. are all held by one owner and form the Capital Plaza shopping center. They are proposed to be zoned Service Commercial (SC-0 and SC-L). The Windsor Park contact team wishes to negotiate a Planned Unit Development on these large properties, and until that PUD can be negotiated, a zoning allowing commercial use incompatible with the mixed-use residential envisioned by the neighborhood plan should not be used. The Windsor Park contact team recommends T4.MS for the first 200 feet facing Cameron Rd. (to be compatible with the T4 and T3 zonining proposed for east of Cameron Rd.) and T5.MS for the remainder of those properties as they approach I-35. The property at 5700 Cameron Rd. is currently proposed as Service Commercial (CS-MU-V-CO). This property is currently developed as apartments and is across the street from current single-story, single-family houses proposed to be zoned T3. Accordingly, the Windsor Park contact team recommends T3.MS zoning for this property in order to ensure compatibility with the surrounding neighborhood and to support the larger vision of Cameron Rd. as a mixed-use, residential neighborhood main street. The properties on the south side of Reinli St. between Cameron Rd. and I-35 (excluding the 5700 Cameron Rd. property) are envisioned by the neighborhood plan as part of a mixed-use, residential neighborhood center. Reinli St. itself could be a great, pedestrian-friendly neighborhood boulevard. Accordingly, the Windsor Park contact team recommends that the first 100 feet along the south side of Reinli be zoned T5.MS, stepping up to T6.MS after 100 ft. (excluding the proposed Capital Plaza T5.MS-based PUD) and when within 200 ft. of I-35. The Windsor Park contact team recommends the properties north of Reinli between Cameron Rd. and I-35 be re-imagined as a high-density, mixed-use neighborhood center, with zoning up to T6-U, with accommodations for current residential development. Please see the below map for details. The Windsor Park Neighborhood Plan Contact Team meets the second Monday of every month at the Windsor Park Public Library at 6:30PM. Contact teams are made up of neighborhood residents, property owners and business operators who serve as the neighborhood's voice before the city government on property zoning changes and other issues related to the neighborhood plan. More information and contact details. Thank you to Windsor Park neighbor-owned theNoise for website hosting! Unless specifically noted, all posts and text on this site are unofficial communications from the Windsor Park Contact Team.